Delicious fresh pasta, ready to serve in under an hour? It’s possible! Follow the simple directions below and watch our How-To video and you’ll be making your own homemade pasta in no time! Spread the durum semolina or flour out on a clean work surface and form a well in the centre. Add the eggs, piercing the yolks, then add the oil and half the water. Use a circular motion to mix the dough by hand, bringing the flour towards the centre until a ball of dough forms. If the mixture is too thick, slowly add water until the dough becomes supple, but not too sticky. Knead the dough for approximately 5 minutes until smooth. Form a ball and cover with plastic wrap. Let rest for 20 minutes at room temperature. With a knife, cut a strip of dough around 1 cm thick and flatten it with your hands. Set the machine to the largest (first) setting. Guide the dough through the rollers. Fold the dough in half lengthwise, then guide it through the rollers again. Repeat 5-6 times (or more), until the strip of dough becomes smooth. Sprinkle the dough with semolina or flour several times while using the machine. Adjust the machine to the second setting. Sprinkle the dough with flour if needed and guide it through the rollers a single time. Do not fold. Adjust the machine to the third setting, then repeat the operation, and so on. 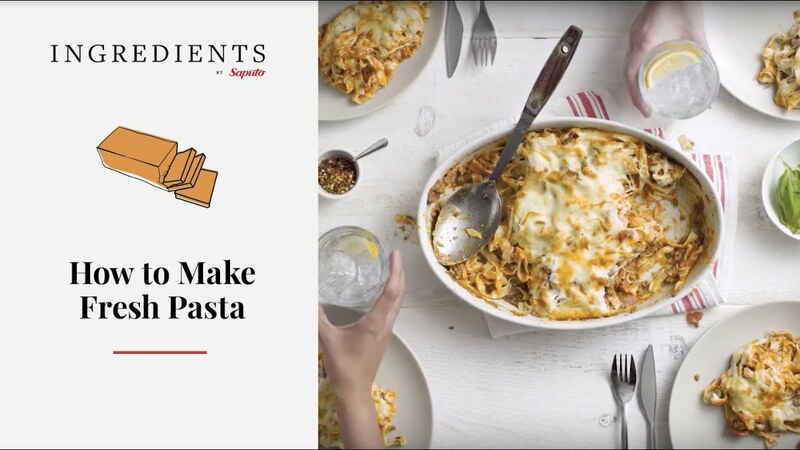 Finish with the fifth setting for spaghetti or filled pasta such as ravioli, or with the sixth setting for lasagna, cannelloni or angel hair pasta. Use the pasta cutter for your desired shape. Cut the pasta and place it on a floured baking sheet. Be careful not to let the pieces touch. Cook the pasta in a large pot of heavily salted water for around 2 minutes.